systems that support scholars’ knowledge sharing and professional learning. Bijker, W. E., Hughes, T. P., & Pinch, T. J. (Eds.) (1987). The social construction of technological systems. Cambridge, MA: The MIT Press. Borgman, C. L. (2007). Scholarship in the Digital Age. Cambridge, MA: The MIT Press. Borrego, A. (2017). Institutional repositories versus ResearchGate: The depositing habits of Spanish researchers. Learned Publishing, 30(3), 185-192. Boyer, E. L. (1990). Scholarship reconsidered: priorities of the professoriate. San Francisco, CA: Carnegie Foundation. Carpenter, J. P., & Krutka, D. G. (2015). Engagement through microblogging: Educator professional development via Twitter. Professional Development in Education, 41(4), 707-728. Donelan, H. (2016). Social media for professional development and networking opportunities in academia. Journal of Further and Higher Education, 40(5), 706-729. Duffy, B. E., & Pooley, J. D. (2017). “Facebook for Academics”: The Convergence of Self-Branding and Social Media Logic on Academia.edu. Social Media + Society, 3(1), 1-11. Ellison, N. B., & boyd, d. (2013). Sociality through Social Network Sites. In W. H. Dutton (Ed. ), The Oxford Handbook of Internet Studies (pp. 151-172). Oxford, UK: Oxford University Press. Fox, A., & Bird, T. (2017). #any use? What do we know about how teachers and doctors learn through social media use? Qwerty. Open and Interdisciplinary Journal of Technology, Culture and Education, 12(2), 64-87. Fu, P.-W., Wu, C.-C., & Cho, Y.-J. (2017). What makes users share content on facebook? Compatibility among psychological incentive, social capital focus, and content type. Computers in Human Behavior, 67, 23-32. Fulk, J., & Yuan, Y. C. (2013). Location, Motivation, and Social Capitalization via Enterprise Social Networking. Journal of Computer-Mediated Communication, 19(1), 20-37. Genoni, P., Merrick, H., & Willson, M. (2005). The use of the Internet to activate latent ties in scholarly communities. First Monday, 10(12). Hoffmann, C. P., Lutz, C., & Meckel, M. (2016). A relational altmetric? Network centrality on ResearchGate as an indicator of scientific impact. Journal of the Association for Information Science and Technology, 67(4), 765-775. Huysman, M., & Wulf, V. (2006). IT to support knowledge sharing in communities, towards a social capital analysis. Journal of Information Technology, 21(1), 40-51. Kimmons, R., & Veletsianos, G. (2016). Education scholars’ evolving uses of twitter as a conference backchannel and social commentary platform. 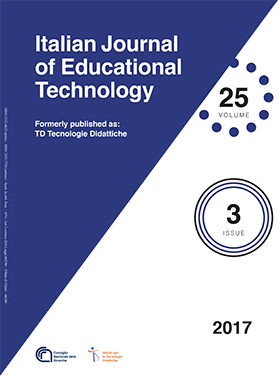 British Journal of Educational Technology, 47(3), 445– 464. Kling, R., McKim, R., & King, A. (2003). A Bit More to It: Scholarly Communication Forums as SocioTechnical Interaction Networks. Journal of the American Society for Information Science and Technology, 54(1), 47-67. Kuo, T., Tsai, G. Y., Wu, Y-C. J., & Alhalabi. W. (2017). From sociability to creditability for academics. Computers in Human Behavior, 75, 975-984. Li, J., & Greenhow, C. (2015). Scholars and social media: tweeting in the conference backchannel for professional learning. Educational Media International, 52(1), 1-14. Lundin, M., Lantz-Andersson, A., & Hillman, T. (2017). Teachers’ reshaping of professional identity in a thematic FB-group. Qwerty. Open and Interdisciplinary Journal of Technology, Culture and Education, 12(2), 12-29. Macià, M., & García, I. (2017). Properties of Teacher Networks in Twitter: Are They Related to Community-Based Peer Production? The International Review of Research in Open and Distributed Learning, 18(1), 110-140. Manca, S. (submitted). ResearchGate and Academia.edu as networked socio-technical systems for scholarly communication: a literature review. Research in Learning Technology. Manca, S., & Raffaghelli, J. E. (2017). Towards a Multilevel Framework for Analysing Academic Social Network Sites: A Networked Socio-Technical Perspective. In A. Skaržauskienė & N. Gudelienė (Eds. ), Proceedings of the 4th European Conference on Social Media – ECSM 2017, Vilnius, Lithuania 3-4 July 2017, pp. 193-201. Manca, S., & Ranieri, M. (2017a). Editorial. Reshaping professional learning in the social media landscape: theories, practices and challenges. Qwerty. Open and Interdisciplinary Journal of Technology, Culture and Education, 12(2), 5-11. Manca, S., & Ranieri, M. (2017b). Networked Scholarship and Motivations for Social Media use in Scholarly Communication. The International Review of Research in Open and Distributed Learning, 18(2), 123-138. Nández, G., & Borrego, A. (2013). Use of social networks for academic purposes: a case study. The Electronic Library, 31(6), 781-791. Nicholas, D., Herman, E., & Clark, D. (2016). Scholarly Reputation Building: How does ResearchGate Fare? International Journal of Knowledge Content Development & Technology, 6(2), 67-92. Nicholas, D., Herman, E., & Jamali, H. R. (2015). Emerging reputation mechanisms for scholars. Brussels: European Commission, Joint Research Centre, Institute for Prospective Technological Studies. Niyazov, Y., Vogel, C., Price, R., Lund, B., Judd, D., Akil, A., Mortonson, M., Schwartzman, J., & Shron, M. (2016). Open Access Meets Discoverability: Citations to Articles Posted to Academia.edu. PLoS ONE, 11(2): e0148257, 1-41. Orduna-Malea, E., Martín-Martín, A., Thelwall, M., & López-Cózar, E. D. (2017). Do ResearchGate Scores create ghost academic reputations? Scientometrics, 112(1), 443-460. Raffaghelli, J. E., Cucchiara, S., Manganello, F., & Persico, D. (2016). Different views on Digital Scholarship: separate worlds or cohesive research field? Research in Learning Technology, 24(1), 1-17. Stewart, B. E. (2015). In Abundance: Networked Participatory Practices as Scholarship. International Review of Research in Open and Distributed Learning, 16(3), 318-340. Thelwall, M., & Kousha, K. (2015). ResearchGate: Disseminating, communicating, and measuring scholarship? Journal of the Association for Information Science and Technology, 66(5), 876-889. Utz, S. (2016). Is LinkedIn making you more successful? The informational benefits derived from public social media. New Media & Society, 18(11), 2685-2702.
van Dijck, J. (2013). The Culture of Connectivity. A Critical History of Social Media. Oxford, UK: Oxford University Press. Van Noorden, R. (2014). Online collaboration: Scientists and the social network. Nature, 512, 126-129. Veletsianos, G., & Kimmons, R. (2012). Networked Participatory Scholarship: Emergent techno-cultural pressures toward open and digital scholarship in online networks. Computers & Education, 58(2), 766774. Veletsianos, G., & Stewart, B. (2016). Discreet Openness: Scholars’ Selective and Intentional SelfDisclosures Online. Social Media + Society, 2(3), 1-11. Weller, M. (2011). The Digital Scholar. How technology is transforming scholarly practice. London/New Delhi/New York/Sydney: Bloomsbury. Williams, R. & Edge, D. (1996). The social shaping of technology. Research Policy, 25(6), 865-899.